The first season of Dexter, a morbidly funny and occasionally gory Showtime series, was just released on DVD this week. 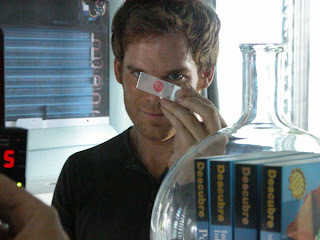 The show's hero, played with an expert blend of creepiness and charm by Michael C. Hall, is your typical Miami Police forensics analyst by day and serial killer by night. But even murderers have a code of conduct, so Dexter only tortures and kills those people who he thinks really deserve it—pedophiles and other criminals who have wiggled their way out of jail. Despite his iciness, it's hard not to root for him—but not in a traditional, manipulative revenge movie sort of way. You see, he may delight in his dirty deeds, but he doesn't respect himself in the morning. Sure, there may be way too many flashbacks that try to explain his behavior, and there's one episode where the writing takes a shocking nosedive, but on the whole the first 12 episodes of Dexter serve up moral ambiguity and dark dark comedy in a neat little crime drama package.